Guatemala’s export-oriented agriculture has stood out for being one of the sectors that generate development opportunities for rural areas and offer employment for more than 2.3 million farmers across the country. Nevertheless, this figure is at risk of facing a decrease due to the lack of export-promotion policies and the bad condition of the country’s road infrastructure. Guatemala’s agriculture products are well-known across the globe, specially in products like vegetables, flowers, fruits, ornamental plants, spices and organic products. Nevertheless, this sector currently faces a stagnation period due to several internal challenges. We urgently need a revolution to be able to achieve sustainable growth for the long term. We currently do not face the competitiveness conditions to compete with Central American countries. We are losing competitiveness as foreign investors do not see in Guatemala the adequate conditions to invest and rather choose neighboring countries. Also, low commodity prices and the currency appreciation has also negatively impacted agriculture exports. 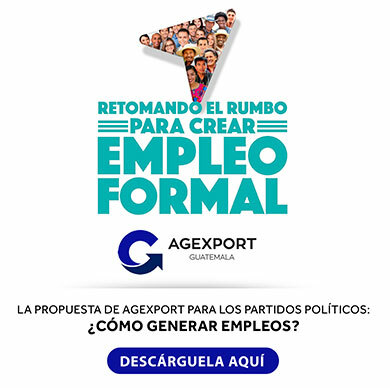 That is why we ask all presidential candidates participating on the 2019 General Elections to include immediate actions to reactivate agriculture in their policies and plans to avoid losing more jobs in rural areas, said Mr. Carlos Salazar, AGEXPORT’s Agriculture Division manager. Despite having more than 360 microclimates that allow the production of a wide range of agriculture products, high logistics costs prevent companies to reach several markets. Also, lack of access to financial resources also prevents a further expansion of this sector as small producers, cooperatives, food companies and others are not able to have the required resources to create innovative products for international markets. AGEXPORT’s Agriculture Division has always been recognized for transforming agriculture production and exporting high-added value products to our main trading partners such as the United States, Europe, Central America and Asia. On 2018, we estimate total exports of around US$1.1 billion. As much as we want to increase this figure, for 2019 we have a risk of not achieving this goal due to several negative scenarios if the government does not boost public-private alliances to take drip irrigation systems to rural areas and implement new procedures and technology to increase productivity, remarked Mr. Salazar. Guatemalan agriculture firms seek to strengthen their presence in rural Guatemala and contribute to develop the capabilities of more small producers in rural areas as well as national and international investors. A good example of the importance of agriculture in terms of generation of foreign currency is cardamom. Guatemala currently holds the global leadership in cardamom production and is also the top exporter. With US$367 million, cardamom exports represent almost 1% of the country’s GDP. This has also helped to develop several areas in the country such as Huehuetenango, Alta Verapaz, Baja Verapaz, Izabal and Quiché. Cardamom production nowadays involve more than 300,000 small producers, said Mr. Salazar. Guatemalan cardamom stands out in several countries and regions such as the Middle East, Europe, Asia, the United States, Canada, Mexico and South America. Its economic impact for Guatemala expands to the entire value chain, starting with small producers whose entire income depend on the success of this product globally. Other important “non-traditional” agriculture products include snow peas, green beans and mini vegetables that are mainly produced in Chimaltenango, Sololá and Sacatepequez. Other production areas include Quiché, Alta Verapaz, Baja Verapaz, Jalapa and Huehuetenango. In these areas, agriculture companies offer full-time employment opportunities for 60,000 farmers and more than 3 million temporary positions annually in more than 200 communities. As such, AGEXPORT’s Agriculture Division is undertaking strong efforts to offer new services to export-oriented agriculture firms as well as other companies along the sector’s value chain. This, to aid companies expand their international presence and increase revenues for rural areas in Guatemala, said Mr. Salazar.